We first found The Little Red Barn in Calabasas and quickly found Baby Cakes, their sister store in La Canada. We met owner and queen of everything that looks beautiful and adorable, Shannon, and we fell in LOVE! You walk into their stores and feel like you are home! Everything is so well put together in the store and there are so many choices! There's the beautiful shabby chic look; or choose cowboy theme, jungle, boys rooms, girls room...whatever your hearts desire, Shannon can create it! With so many things to plan during your pregnancy, why not let The Little Red Barn and Baby Cakes help you with your nursery design?? 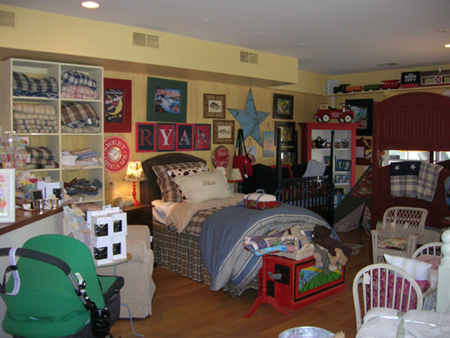 They specialize in all aspects of nursery design from furniture and bedding to wall decor & rugs. With almost seven years of experience and two Southern California locations, Baby Cakes is well known for their custom 4 piece crib bedding that starts at $265! Visit www.babycakesLA.com for fabric swatches and call for a complimentary design appointment today for fresh ideas & the perfect nursery!